Periphery’s concept album Juggernaut has been long in the making. It started as guitarist Misha Mansoor’s plan for an extended composition made up of different sections. Eventually, this plan turned into a whole album – a double album, that is. 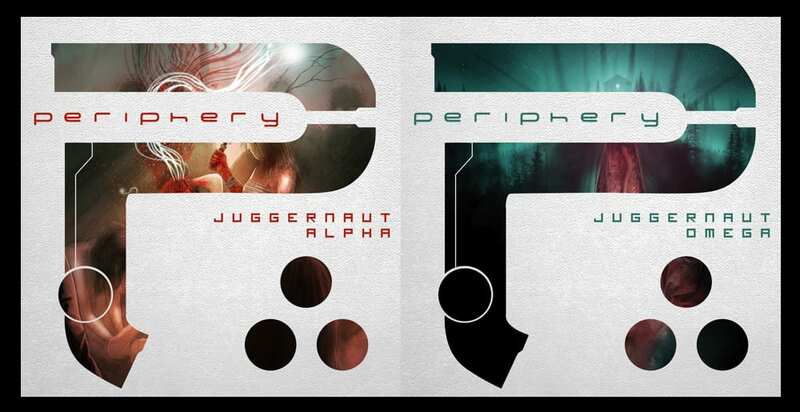 The concept album known as Juggernaut was supposed to come out a few months after the band’s second album, 2012’s Periphery II: This Time It’s Personal. But touring took the first priority, and Periphery ended up making a quick EP to hold fans over. After Clear came out in January 2014, the band was ready to finally finish this album and get it out. The wait was worth it. Juggernaut: Alpha and Juggernaut: Omega – the two halves of Periphery’s ambitious new double album – are both incredible impressive and beg to be listened to again. While they make one complete work together, they are also strong as standalone records, each with its own sound and mood. Juggernaut: Alpha pushes the boundaries, combining heavy guitars with brilliant melody and an accessibility that can attract fans that are newer to the genre. Juggernaut: Omega, on the other hand, is a heavier, more “djenty” album with darker themes. It’s less happy than Alpha, but just as complex. Both records fit with Periphery’s progressive tendencies, and while Juggernaut incorporates their best styles from the first two albums and Clear, it also expands beyond that. This is both a marked evolution and a fine-tuning of Periphery’s best talents. All in all, Juggernaut: Alpha and Juggernaut: Omega are albums that can please and surprise Periphery’s whole fan base. Whether you liked their first album best or are more into Clear, Juggernaut has something for everyone. And on top of that, this is a record that is accessible to newer fans who may not be as accustomed to the low tuning and aggressive metal guitars. It’s no pop album, but Juggernaut is something that can capture the interest of new metal fans. “A Black Minute” – Our introduction to Juggernaut is “A Black Minute” – a beautiful, strange, and melodic track that show off vocalist Spencer Sotelo’s range. The first verse introduces peaceful nighttime imagery, but when that verse is repeated later in the song, it has a growling, pounding sound that makes it less serene. “MK Ultra” – The second song has a much deeper, more djent sound complemented by growling vocals. It’s dissonant and dark… until the unexpectedly jazzy ending. “MK Ultra” switches to a bossa nova ending that has the opposite mood of the first part of the song. “Heavy Heart” – This is a highlight from the Juggernaut albums, even though it’s a bit more simple and classic in sound. It also has the melodic focus and friendly appeal that was displayed on Clear. “Heavy Heart” is the kind of song that can appeal to non-metal fans, but in spite of that (or maybe because of that), it’s a standout track on Alpha. “The Event” – Periphery has done instrumental tracks before, and “The Event” is a short but good one. It’s slow and sludgy, with a pounding energy and just enough unexpected notes to keep it interesting. “The Scourge” – Fans first got to hear this a few weeks ago, and it remains one of the best songs on Juggernaut. At first it sounds like an old movie thanks to the strings and piano. The song continues deep and low, creating a mood of an evil nightmare. Midway through we get a growling chant that sounds like a murderous monster, but the repeated “I will survive” is anthemic and gives “The Scourge” resolution. “Alpha” – The first album’s title track, “Alpha” starts with a video game music intro. It doesn’t last long, and the song gives way to a melodic, uplifting song that actually has a nice message. The chorus is catchy, and this is probably the friendliest song on the album so far. It gets heavier and grander later on, before ending with the same video game music that started it. “22 Faces” – This is another standout song on Juggernaut. It’s heavy with a particularly catchy chorus. The bridge is also one of the strongest on the album. Although “22 Faces” doesn’t pack any big surprises – unlike the other songs – it is perfectly executed and is very enjoyable. “Rainbow Gravity” – This opens with some nice guitars and ends up being another of the more djent songs on the album. It has a very Meshuggah inspired sound, and Spencer Sotelo sings out a mouthful of words. The song gets more anthemic later on, then ends with punchy guitars. “Four Lights” – The second of two instrumental tracks, “Four Lights” is also brief, but packs plenty into just over two minutes. It’s similar in style to “Rainbow Gravity,” with a heavier and deeper sound that gets even sludgier and darker halfway through. There’s a brief but creepy and nightmarish music box twinkling sound, but then the pounding guitars return to finish the song. “Psychosphere” – Sometime songs just sound like they were meant to be an finale song, and this is one of them. It has an eerie, horror movie beginning, followed by nice guitars. But before the first minute is up, the pounding djent comes in. “Psychosphere” has an ethereal, spacey, ungrounded feeling and an odd time signature. The repeated “kill them slow!” refrain builds up the ending, sounding anthemic yet sinister. The last “kill them slow!” sounds haggard and raw, and a long outro closes the album. “Reprise” – Omega starts with clean guitars and pristine vocals, but the most intriguing thing about “Reprise” is how the lyrics mirror the opening song from Alpha, “A Black Minute.” In “A Black Minute,” Spencer sings “Our voices echo on a quiet night; silver faces, an unholy cathedral; moon and sun; a birthing rite in this duality.” But in “Reprise,” the words have turned more sinister: “Their screams will echo on a quiet night; silver faces, an unholy cathedral; death has come; a sacrifice in this duality.” It continues like that, changing lyrics for the worse in this short but eerie and foreboding song. “The Bad Thing” – If you like dissonance, heavy riffs, and the classic Periphery sound, “The Bad Thing” is the song for you. It has some metalcore-inspired breakdowns, yet a melodic chorus. It continues the eerie atmosphere all the way to the end. “Priestess” – This is one of the definite highlights on the Juggernaut albums. “Priestess” strips everything away for some nice, clean, acoustic guitars. The song is calm, but there’s a subtle darkness lurking in the background – it recalls Opeth’s 2003 album Damnation in a certain sense. It’s intricate and complex, yet accessible and reminiscent of Clear. “Priestess” is very different from the other songs, but it stands out as one of the highlights. “Graveless” – “Graveless” is pounding, fast, and brutal. The over-the-top chorus recalls Periphery’s “Make Total Destroy” from their second album. The lyrics are the darkest part of all though, describing a suicidal moment in all its gory detail. “Hell Below” – This is actually one of the standouts on Omega, especially because of how clearly it paints a picture and a mood. “Hell Below” opens with the ultra low notes and a Meshuggah-inspired heaviness. The lyrics and vocals match the music exactly, radiating darkness and hellishness in the ominous “live, die, burn” chant. But be prepared for a big surprise when Periphery suddenly switches gears and goes into a smooth jazz ending. The calmness and nice piano are a stark contrast to the rest of the song before. “Omega” – The second album’s title track is also the longest and most ambitious in Juggernaut. Over nearly 12 minutes, Periphery covers a range of styles and moods all in this one track. “Omega” opens with that unexpected piano bit from “Hell Below,” but quickly goes back to the heavy djent and evil sound they were doing before. This song is brutal and dark, like an assault on your eardrums as you go further into the depths of hell. But after a few minutes and at least four distinct parts, we finally have some melodic vocals with a higher, cleaner pitch. This part sounds more like Clear. It then slows down to have some cleaner guitars and piano in the background; it’s jazzy all of a sudden. But then for the next surprise: The chorus from “Alpha” suddenly makes an appearance! Spencer reminds us: “Stop bleeding on the inside, we are alive, and it’s more than enough to paint the walls that are white, can we show the ones who are blind?” It’s like a grand finale to a long and complicated suite. “Stranger Things” – The final song of Omega – and the whole Juggernaut duo – has a very Clear sound, but a bit heavier. Spencer shows off his range again, going from high falsetto vocals to low growling notes and back to his signature high shouting. A rolling drum is followed by the tinkling lullaby music box sounds. “Stranger Things” sounds like a conclusion song, and it’s the perfect way to wrap up such an ambitious and stunning set of albums. You can buy Juggernaut: Alpha and Juggernaut: Omega on iTunes now.